As a lover of all things floral, I have been longing to go see the Huntington Library with its beautiful botanical gardens. I must admit, it didn't disappoint. After a friend introduced me to Filoli in San Mateo, a few years ago, I discovered how much I loved exploring the gardens and seeing the detailed architecture and antique furnishings in person. While doing some research one day, I stumbled upon the Huntington Library website and knew it was a must see for me. Of particular interest of course, the European art and furnishings collection, rose garden, Shakespeare garden, and the potager style herb garden. I love gardens in the Old English and French styles. However, I was also really quite impressed with the Chinese garden. The reflection of the water, buildings, and landscape was quite lovely. The Japanese garden with its bridge was another favorite. What most surprised me by all of these gardens was their size. The Huntington gardens span 120 acres of land and each garden does feel quite large. The old buildings are beautiful to look at with all their architectural details and history. The buildings in the Chinese and Japanese gardens were crafted true to their historical style which adds to the beauty and authenticity of the gardens. Here are a few pictures of the rose, Shakespeare and herb gardens. 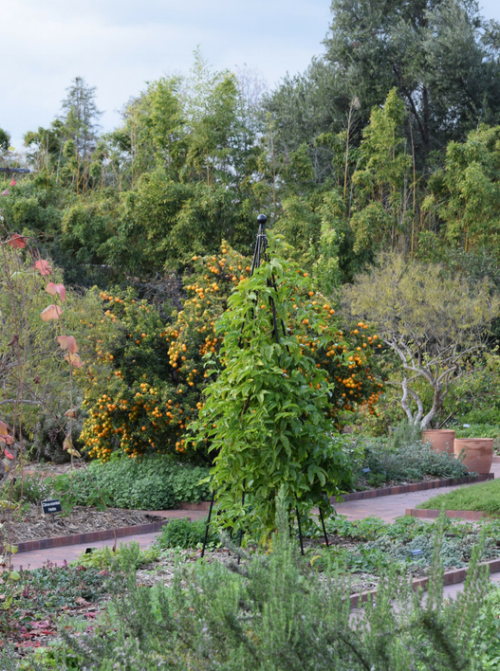 I really enjoyed my visit to the Huntington Library, and I can't wait to go back hopefully in Spring. Flower beds introducing the rose garden. Rose arbor with box hedge. Column of roses with rose garden fountain. Not sure the name of this tree, but it was beautiful with its hanging pink flowers.